There’s something in the water this week at Sony Pictures Studios – and I want whatever it is. On average, around 8.5 players each week enter Final Jeopardy! with five-digit scores. So far this week, we’ve had eight – and the lone holdout, Leslie from Monday’s game, was just 300 short. This one’s trickier than it looks at first. If Alvin doubles his score, he’ll have 26,400. 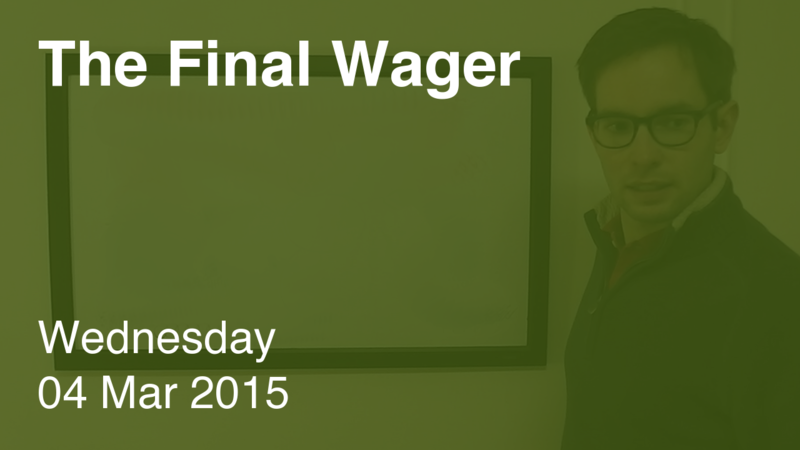 To cover this all-in wager, Dave will need to wager 10,200. 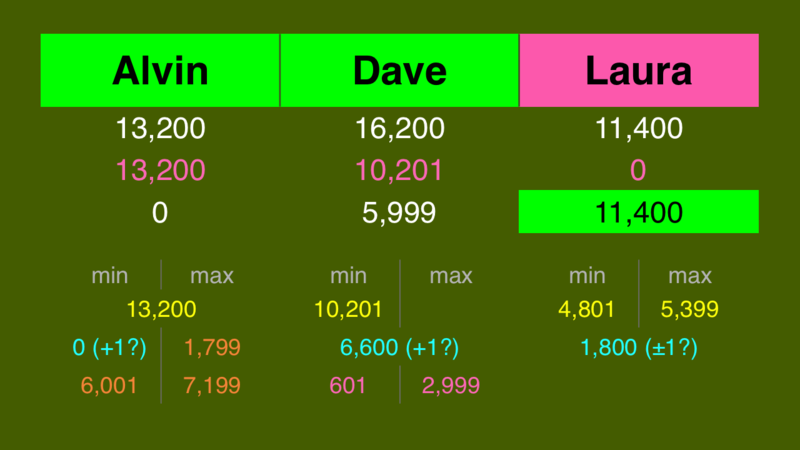 An incorrect response with that wager will leave Dave with 6,000. To stay above his total, Alvin can wager up to 7,200. Laura can wager up to 5,400. A successful doubling will put Laura at 22,800. To cover this, Alvin should wager at least 9,600. 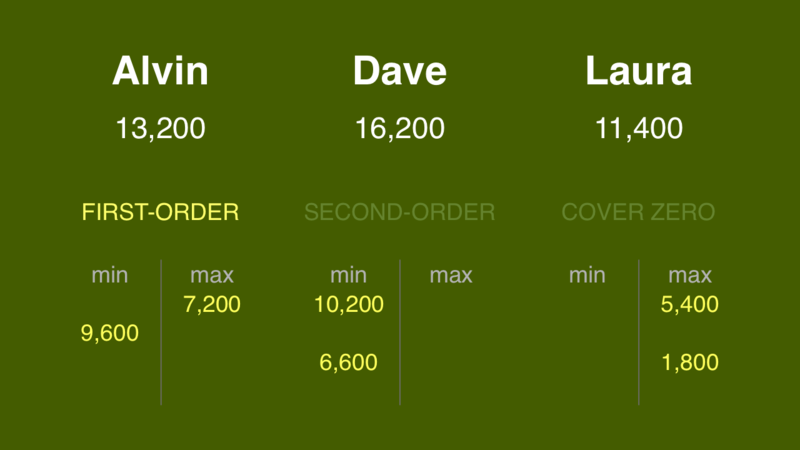 Dave would need to wager at least 6,600. Alvin is in Stratton’s Dilemma: if he covers Laura and gets it wrong, he’ll lose to Dave. If he chooses this route, therefore, he should go all-in. 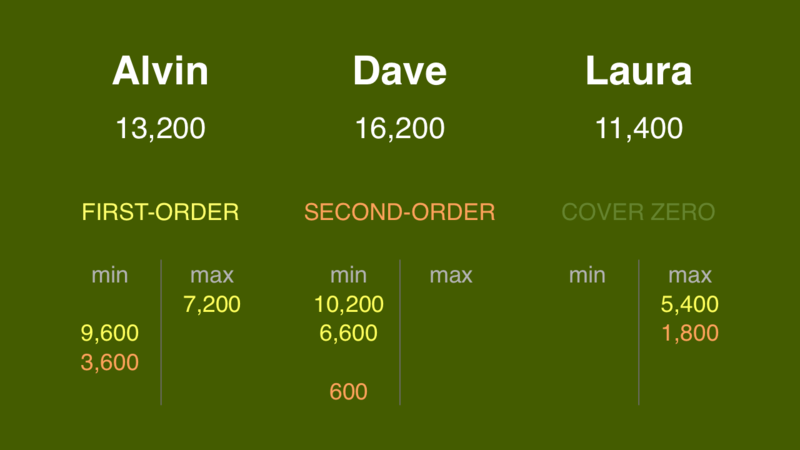 If Alvin makes the rational maximum wager of 7,200, Dave will need to wager 4,200 to cover him. But at that rate, he might as well cover Laura, too. Maybe Laura goes for her 5,400 maximum. In that case, Alvin should wager 3,600, and Dave, 600. If Alvin’s wrong, Laura can wager up to 1,800 to stay above him. What happens when each player wagers against potential zero and Colbyesque wagers from their opponents? We run into a problem. Laura is almost forced to wager 1,800 in that lower range, which has knock-on effect to the other players. 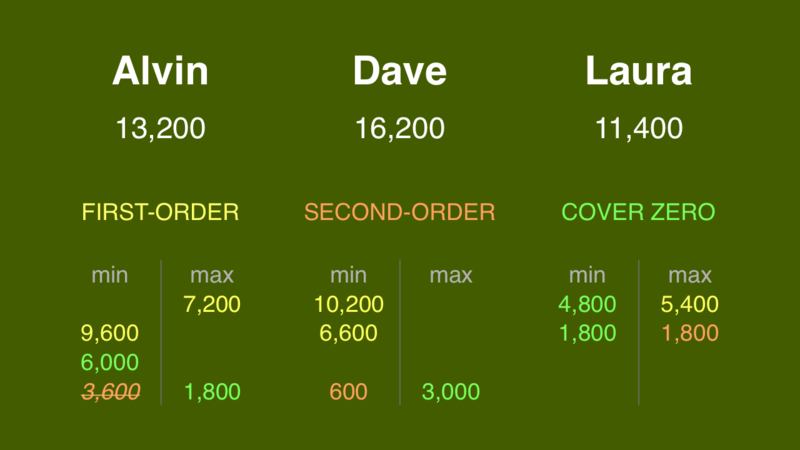 If she adds a dollar, she covers a zero wager by Alvin (unlikely); if she withholds a dollar, she can stay above a wager to tie by Dave if he aims to cover her all-in (even more unlikely). In her shoes, I would be more aggressive, and max out at 5,399. Laura’s wager is fine, of course, but I need to judge based on the math. Either way, she’s got the money, and a second date with the signaling devices tomorrow. Perfect wager by Laura. She needs a triple stumper. Chance that 1st and 2nd don’t bet big enough to drop below her current score is essentially 0. Probability that they both don’t wager enough to cover Laura’s double is also pretty low, so she really needs them both to miss to have any realistic shot. Triple stumper occurs twice as likely as a single get by Laura (19% vs 9%), so by far her most likely winning scenario is a triple stumper, therefore betting 0 is the best play.